There was a time, not too long ago, when every business that dared to call itself legitimate had an office. This necessity created many of the images that we associate with business success today. Who doesn’t imagine the friendly secretary in the lobby, the coveted corner office, or the wood-paneled boardroom when they think about what it must be like to have a successful company? These are nearly universal images, but they have less and less to do with business now that the information age is reaching maturity. Many modern businesses don’t have offices, and more of them are being founded every day in coffee shops, libraries, and living rooms. An internet connection is one of the only barriers left between a merchant and a consumer, and the global recession has encouraged even large companies to re-examine what a traditional office actually offers them. There are several distinct advantages to abandoning office space. First, there are very few communication problems left. Even the most complex teams can be easily managed with collaboration software, and these teams can now be located all over the world. Second, most interactions with both customers and clients will occur online, anyway. Finally, office space is a major expense considering both the previous points. It’s certainly too much of an expense for most start-ups that are still trying to get off the ground. That said, there are many advantages that an office offers. Most significantly, it is a place for people with similar interests and expertise to connect and develop. The kind of spontaneous collaboration that happens in offices is hard to replicate when communication is done online. However, there is a way to capture the best of both worlds through shared office space. Those who run internet businesses probably don’t have enough employees to make office space worth it. That doesn’t mean they won’t enjoy a space dedicated to work, and being around people who share the same interests and industries. Shared office space comes in many different forms. Typically, when someone who owns office space has trouble renting the property whole, he or she will experiment with selling access to space within the office instead. Sometimes, businesses will end up with more space than they need, and try to use up the rest of the space by sub-letting it to other small ventures or individuals. Other times, the office space will be specifically designed so that it can be used as shared office space. The result is the same. Many different people, affiliated with many different businesses, will end up enjoying the same office space. In most cases, only a few businesses will be represented. However, some offices will be shared between dozens of different people working independently on their own businesses. The shared office may be organized so that everyone has their own enclosed room, or as an open space where territory is only defined by the position of the desks. This arrangement can sound very confusing to those who haven’t experienced it, yet. However, shared office space offers several serious benefits to the people who take advantage of it. 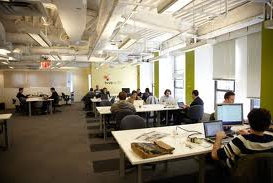 What Benefit Does Shared Office Space Offer to Start-Ups? There are several important benefits that shared office space offers to startups and other small businesses. For many people, shared office space is attractive because of the cost. Shared office space is very cheap, often only a fraction of the price of normal offices. This makes a huge difference in major hubs like New York and London. Most start-ups would not be able to have any space where they could meet people professionally if they were not able to take advantage of shared office space. The most significant benefit of sharing office space is likely the opportunity it offers to meet forward-thinking people who are in the same industries. Many shared office spaces try to develop a “culture”. That is to say, they try to lease shared office space to people that share the same interests. Some shared office spaces are populated almost entirely be people who are running social media businesses. Others may be focused on accounting or finance. It was never easy for small business owners to meet one another. It can be a very lonely life. Shared office space is one of the first modern developments to allow these business owners to meet and work with each other on a daily basis. Many people who have tried shared office space say it works like an incubator. It’s much easier to learn and develop in an industry when you are surrounded by people who share both your interests and your motivations. It may not be easy to find shared office space where all the tenants are in the same industry as you, but it is at least easy to find shared office space all over the world. Where Can Shared Office Space Be Found? Shared office space can be found in almost any major city, and it is also showing up in a lot of smaller towns as well. Shared office space can be found through traditional classifieds like those on craigslist, but there are also some websites that now specialize in matching people who want office space with those that are setting up shared arrangements. Should You Consider Shared Office Space? Shared office space might be a good fit for you depending on your situation. If you only have a few employees, it can be a great way to save some money on full office space. If you are self-employed as the only person in your business, you may benefit from having a change of scenery and somewhere you can focus only on work with no interruptions. You should also consider what you have to gain by meeting other people who could help you with your business. It can be very hard to find mentors and people who share your vision. Sharing office space could give you that opportunity. Simeon G Howard, born in Hampstead London, started his first business at age 21. By age 25, this serial entrepreneur had founded Your City Office Ltd, a Virtual Office and Office Space brokerage firm. Drawing from his past experiences, he and his partners have quickly built and developed one of the UKs leading organizations in this industry.